Unbelievable Storage: No other bag has this many compartments! Plenty of room for gadgets, books, water bottle & ipad. Easy access to small items. Also has RFID blocking anti-theft pocket for valuables. Durable:Water-resistance material,Stronger zipper,Don't need to worry about zipper and The spacious main pocket can holds iPad. MULTI POCKETS: Two zippered main pockets, a small zippered pockets, a hidden anti-theft pocket, one strap pocket and one side mesh pocket. 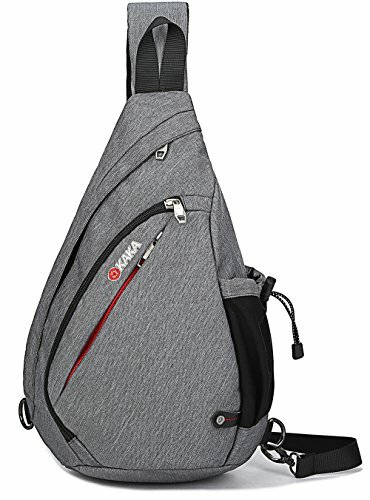 Stylish, multi-function and practical design.PERFECT for outdoor hiking, camping,climbing, cycling, day trip, vacation, travel, school, shoppingWe promise lifetime warranty. If you have any problem about the item, Please Do not hesitate to contact us.